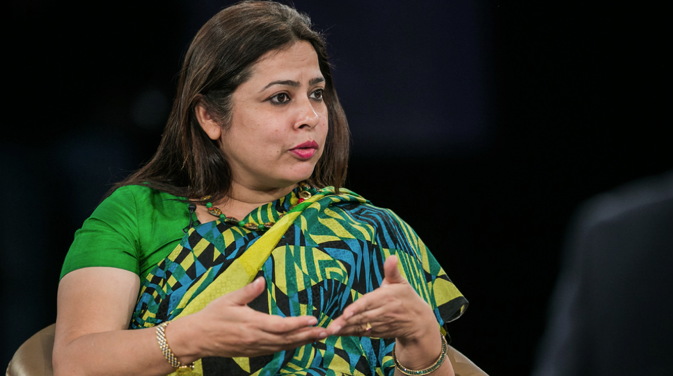 Meenakshi Lekhi, a Member of Parliament in the Lok Sabha (lower House) from the New Delhi constituency and national spokesperson of India’s ruling Bharatiya Janata Party (BJP), recently opened the first BRICS Youth Forum. In this wide-ranging conversation with RIR, Lekhi speaks about the need for the BRICS countries to forge their own standards in areas of health and education and new areas of cooperation between India and Russia. How do you see the BRICS as an organisation today? The BRICS countries actually represent the engine of power, but unlike the EU, we somehow fall short. We have not been able to establish that. I feel that the EU comes together whenever there is a gas issue, price issue or any monetary issue; they all come together but unfortunately the BRICS have not succeeded so far in projecting this forum. You work a lot on social issues. Do you see any possibility for such cooperation between the BRICS nations? The Ministry of Health, Ministry of Education and the Institute of Statistics were supposed to work out a joint methodology for determining social indicators to be published in the BRICS’ joint statistical publication. This is important because the world standardisation norms are till this date from countries other than these five countries. Even five of us vary in terms of genetic make-up; for example, when we discuss children’s malnutrition status. So malnutrition is adjudged by the weight of the child at the time of birth, height of the child at the time of birth and such indicators. Now obviously, a Russian indicator is different from an Indian indicator or a Chinese indicator but the standardisation is as per the US indicators or other such indicators. That is where some other sort of standardisation in the world must come because with that (West-centric) standardisation, we are actually in the process of excluding the gene pool of a particular country. Like even in India, the gene pool of northeastern states is going to be very different from the gene pool of Punjab or Rajasthan for that matter. The height varies and the weight varies and that does not make a person malnourished because genetically, you are small, short. So we need different standardisation procedures and the BRICS can come together to give an alternative standardisation methodology. Similarly, education and institutes related to it should be incorporated in the processes because that process is done by the experts and let the experts take over their job and not generalists like me. I work very closely with a group of scientists from IIT Delhi, which is a part of my constituency and I have a very close relationship with them. In fact, we came up with a solution which we have not disclosed as yet but it is like a pillar which can collect information about the surroundings immediately and is different from CCTV because the images can be destroyed or the cameras can be destroyed. In this particular case, the images are collected and by microseconds, sent out to a server. So you cannot destroy those images in the area and can also cause alarm. It has got an alarm device as well. So certain vulnerable sections can use that. I am sure, that the problem of women, its vulnerability half the time is due to bad economic conditions because if you look at the trafficking routes, they always start from bad economies and end up in good economic markets. So exploiters are usually the ones who are better off people in terms of financial status. Whether it is Russia or vulnerable sections of India, we face a similar kind of problem because of our openness in the society. The exploitation of women also happens and all that needs to be controlled. Sometimes we do well and then we come down, then we do well, then again all that is getting lost in the next five years. So that is what we need to change now and make it more sustainable because most problems, whether it is malnutrition, safety, orvulnerability, they have deep roots in the economic setup and in a certain mindset. So we all need to grapple with mindset changes because we are getting influenced by ideas which are definitely, I feel, not mine, and not my social setup as I grew up. I do not think I was treated any differently than my brother and I come from a Punjabi background and a family where my father treated us alike and made us equal. When I look around and I feel when similar families do not allow their daughters to be born or do not treat them equally, it is pathetic because that is not who I am or I believe in. So I guess historical changes, exploitation, everything can be taken care of as we have a more aware society which is a value-based society and values are again something Russia and India share and have a lot in common. Experts discussed students` exchanges a lot at the BRICS Youth Forum. Do you see the need to work out a plan how to develop this area also? Absolutely. In fact, I feel there should be a credit system between the universities so that if I go out for studies, two months or five months or six months, submit my paper in your university, it should be recognised by my university here. Let us do that. I mean let us work out something of that sort because at least within India, we have a system called national law schools and they have certain tie-ups with Yale and Stanford and some such universities and there is an exchange of legal fraternity between them and they have a credit system also. I am saying this because my own kids are studying there and they get credit in their college if they go and do one semester outside in any other university. So if we can maybe put Moscow University also as a part of that and maybe so far as science and technology is concerned, one semester from IIT, you can do it at one of your space research institute and get credit for that.